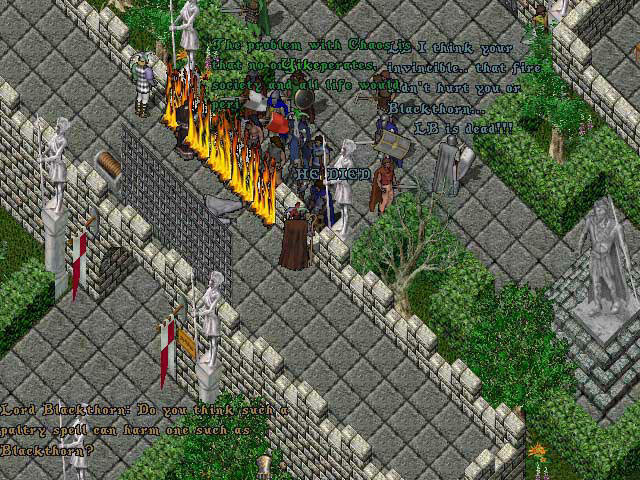 Among Ultima fans, killing Lord British has become something of a game in itself. Simply attacking him is usually fruitless as he is extremely powerful and usually flagged as invincible to boot. However, whether by design or mishap, he can be slain in several games, usually through unconventional means. So in the true tradition of Ultima, here are all the ways to kill Lord British throughout the series that I could find or create proof of. If you have proof of any others, let me know! Lord British is immune to all weapons; however in some versions of the game, it is possible to kill him via ship cannon. In most versions, Lord British is invincible. However, he can be killed in the NES port through combat. The Skull of Mondain will also kill him in the NES port. Easy enough. Just enter his room while he's asleep and use a Glass Sword to kill him instantly. The first option is to simply ask the Black Sword to kill him. This results in a bit of humorous dialog and everyone present becoming quite upset at your actions. The second method is even sillier. At roughly noon every day Lord British stands in the doorway to the courtyard, beneath a plaque. Double-click the plaque and it will fall and embed itself in his head, killing him on the spot. This is actually a reference to a real-life event where Richard Garriott was injured by a metal bar that fell from the Origin building. The line "Yancey-Hausman will pay!" refers to the company that owned the building at the time and was responsible for its maintenance, making the incident partially their fault! Talking to Owings and Malloy in the Minoc mines will reveal that they sent a helmet to Lord British, another reference to the story. Again, this one is played as a bit of a joke, as the player can simply attack Lord British while in the Dream Realm. This causes him to lament the Avatar's fall from grace and vanish. Lord British died again in Shroud of the Avatar, albeit intentionally this time. A large mob of players attacked and eventually brought him down during a PVP event.